My draw for today, 7/23/18. I fell in love with Oblique Strategies when I fell in love with all of the above records that were created with its assistance. Oblique Strategies was one of the first apps I installed on my first iPhone (and have had on every phone since). When I heard, in the early aughts, that the long out-of-print deck was back in print, I jumped at the chance to finally own a physical copy. In my world of hoodoo and woo-woo, oracular cards should be physical. I use my deck quite a bit and love how it fits into my creative process. One of the things that I think makes Oblique Strategies so effective for so many people is how annoying, ponderous, and impenetrable many of the cards are. "Simplify a matter of work," "The inconsistency principle," "Only a part, not the whole." You really have to work to try and reconcile the problem that you're facing with one of these often vexing statements. And that's often where you find your ah-has, in the midst of the mental gymnastics you're doing in trying to match up the drawn card with your "worthwhile dilemma." And that's why I am now so in love with artist and musician, Noah Wall's meta-generative response to Eno and Schmidt's generative art cards. 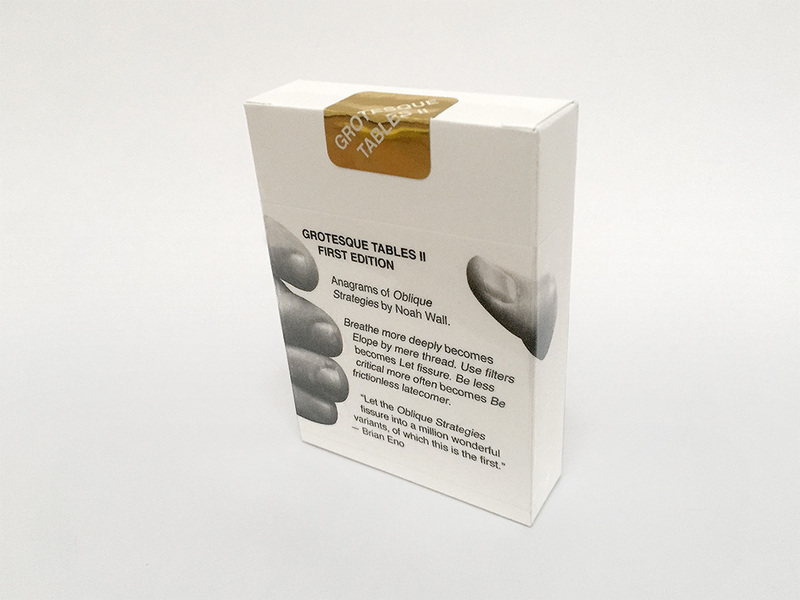 Called Grotesque Tables II, this is a deck of cards comprised of anagrams of Oblique Strategies. The phrases on the cards, as well as the deck’s title, are anagrams of the originals. (There is no Grotesque Tables I: the II is the pair of “i's” from the original title.) So, you get things like: “Be Frictionless Latecomer" out of Oblique Strategies' “Be Less Critical More Often,” "Notice Arc" from "Accretion," and "Elope by mere thread" from "Breath more deeply." I found out about Noah's deck when it was mentioned by Eno himself in a lecture that he was giving at the Edinburgh College of Art. He mentions it at the very end of the lecture (at 01:34:32). About Grotesque Tables II, he says: "The results are completely nutty. They say things like 'Fat hen kick?' They are much more difficult to use, and in fact, much more inspiring in a way than the original cards. [laughs]" He seems to recognize the fact that it is the ponderous nature of Oblique Strategies' statements that make them so effective. I haven't found Grotesque Tables II to be harder to use, they just make a different part of my brain feel funny. On the inspiration for creating the cards, Noah told Electronic Musician: “It came from the idea of taking an iconic piece of generative art and using it to make another, new generative piece,” he explained. “There is an Oblique Strategy that reads ‘Do the words need rearranging?’ I read this as an invitation to transpose the original strategies into new, further obliqued prompts by way of anagrams. Taking the idea even farther down the generative art rabbit hole, Noah has also produced Scores, another pass of the cards through the anagram process, but this time pulling musical notes from the available letters so that each card has a fragment of a score plus an anagram. This is ripe for all sorts of sound and spoken word applications. On Noah's website, he maintains a page called GROSS. Here he collects various art and music projects that were aided by Grotesque Tables II and Scores. You can also purchase copies of the deck directly from Noah on his site. Frederik Vanhoutte describes himself as a creative coder who works in the field of generative art. His site W:BLUT has lots of cool little experiments. Above, Big Red I, a longer fractal experiment that evokes FRank Lloyd Wright.